The legendary Queen of Soul, Aretha Franklin was spotted at a Detroit Pistons basketball game with Rev. Jesse Jackson. 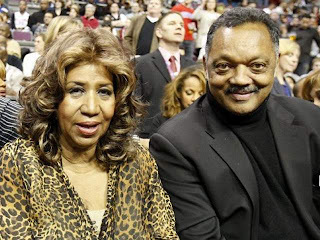 The great Queen of Soul looks noticeable smaller after her recent battle with an undisclosed illness. In an phone interview with Wendy Williams, Aretha commented that she was down to a size 16 and she was working to keep the weight off. Looks like Miss Franklin is keeping her word and keeping the weight off. Many Blessing to the Queen. Don't forget the Grammy Awards will be paying tribute to her with performances by Jennifer Hudson, Christina Aguilera, Martina McBride, Florence Welch, and Yolanda Adams. The performance should be awesome with that talented crop of singers. You know Christina will be looking to redeem herself after her lyrics mess up on the National Anthem at the Superbowl.